Earlier this week, I happily completed the centre garter stitch section of the Bridgewater shawl, decreasing all the way to the top point of the square. It was great. Now all I have to do is pick up approximately eleventy million stitches around the edge, and then I can start the lace edging. 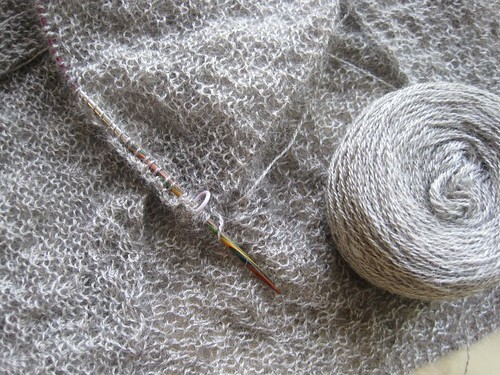 I’m going to guess that means I’ll be starting the lace edging, oh, some time in July. Or, perhaps just a few days. The yarn (Wellington Fibres mohair/wool 2-ply laceweight) is very, very lucky to be so pretty, I wouldn’t do this for just any skein. I hope you’re knitting something awesome, folks! Well not as awesome as that! I was thinking of doing that in a heavier weight alpaca to make an afghan, but the thought of THAT many stitches on an even larger piece of knitting has kept me from starting the project! Well, that and the other stuff I keep knitting instead. I can’t wait to see yours done, though. I’m using up knobby homespun in charity afghans, and it’s nothing I want to photograph and show my friends, trust me. Every time I think of knitting Bridgewater, I read the directions again and just cannot imagine picking up that many stitches. I admire your courage in doing so, especially with what looks like a tricky yarn. This is beyond awesome…it’s truly a work of art! I admire your perserverance! Although I’m very late to the party, I’m knitting Sally Melville’s Einstein coat and love it! I just had an opportunity to try a completed one on for size and it was amazingly heavy and warm (wool and mohair held together). Perfect for New England autumns and springs…and possibly for some milder winter days when I’m just running from my car to wherever! Life’s too short to not absolutely love what I’m knitting! Can’t wait to see you modeling your masterpiece! you are a better person than I!!! I go nuts picking up the right number of stiches for a sock… I try to knit to stay sane not go insane…. no really that is so lovely maybe someday I too will have the guts to give it a try. awesome. lucky/pretty yarn is the best. good luck with the picking up! I finished a sweater a few months ago with 405 stitches picked up for the edge all the way around. Thought. I. Would. Die!!! I don’t mind picking up a few for a button band, but eleventy million is a horrifying thought. Good luck … can’t wait to see your pretty finished shawl! I hope you are going to show how to pick up those stitches on the edge. Someone tried to show me how to do that and it didn’t stick. I ended up with a puckered edge and had to frog it. The edgeless shawl is still tucked away but hopeful of completion.